Taking notes from Paramore and expanding the rock, My Arcadia is bringing their sound to your ears. Only forming a year and a half ago, the New York band is already generating buzz. Lead singer Jacqui Sandell has a perfect voice for the guitar driven sound and pop influences. 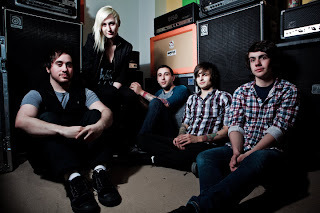 My Arcadia was chosen as a top 20 unsigned band of 2009 by Purevolume, and it is well deserved. Their tunes are catchy, in your face, and are not stop fun. For such a young group and newly formed, they have accomplished more than some bands may ever get to do. You will be seeing My Arcadia in the near future, there is no way they won't blow up if they keep up the music. You may be saying "Paramore who?" very soon. Listen to some songs below, also they have a new track, "My Pioneer" on their Purevolume account and a free mp3, which you can check here.